A tooth abscess can be a very painful and uncomfortable experience. 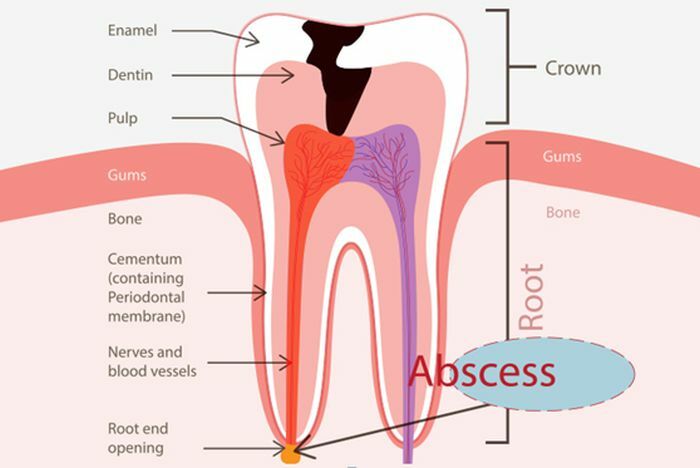 The reasons why an abscess develops in a tooth vary, but it’s always the consequence of bacteria entering the pulp and infecting the nerve tissue inside it. This can happen if tooth decay goes past the enamel and dentin and reaching the pulp, or if a tooth is fractured, or if during treatment for a cavity, the pulp is exposed; even microscopically. When the bacteria reach that center part of the tooth, it attacks the nerve tissue and blood vessels in it, infecting it. Then pus begins to accumulate inside until it needs to go somewhere, so it normally goes to the apex of the root, where it also attacks bone tissue and swells and causes a lot of pain. A tooth abscess needs to be treated by a dentist, but if you’re in a place or moment where a dentist isn’t available, then there are ways to relieve some of the pain, and at least get you through the episode until you can reach your dentist. A salt water rinse is recommended to sooth pain when you have an abscessed tooth, it is also cheap and easy to apply. One advantage of salt water rinses is that it also helps with healing the wound and promotes healthy gums. Mix ½ teaspoon of table salt (regular salt) in ½ cup of warm water. Rinse your mouth with the mixture and swish it around inside your mouth for two or three minutes. Spit it out. Repeat several times a day. Baking soda has antibacterial properties, so it helps not only with the infection in your abscessed tooth but also with removing plaque. It is also an easy and affordable option for this situation. Mix ½ tablespoon of baking soda with ½ cup of water and a pinch of salt. Swish the mixture in your mouth for 5 minutes. Spit out and repeat until all the mixture is used. This is an oil that can be purchased at health food stores or drugstores. It has antioxidant and antibacterial properties, so it can be very helpful with reducing the swelling and the pain that comes with an abscessed tooth. Take a cotton ball or swab and put some drops of oregano oil to it. Hold the swab or cotton ball with the oregano oil on the infected area for three minutes. Remove the cotton ball or swab, but leave the oregano oil on for another 10 minutes. Rinse. Repeat two or three times per day. A cold compress can be useful to reduce swelling and pain when you have an abscessed tooth, and it is very easy and quick to use. Just take some ice cubes and place them on a dry towel. Hold the towel with the ice cubes in it against the skin near the affected area. Use for 15-minute intervals. You can repeat this several times per day. This is an excellent way to help with bacterial infections, including an abscessed tooth. It also helps with a plaque and if you have bleeding gums. Mix equal parts of 3% hydrogen peroxide with water. Swish the solution around your mouth and spit it out. Make sure you don’t swallow any of it. This can also be used several times per day. 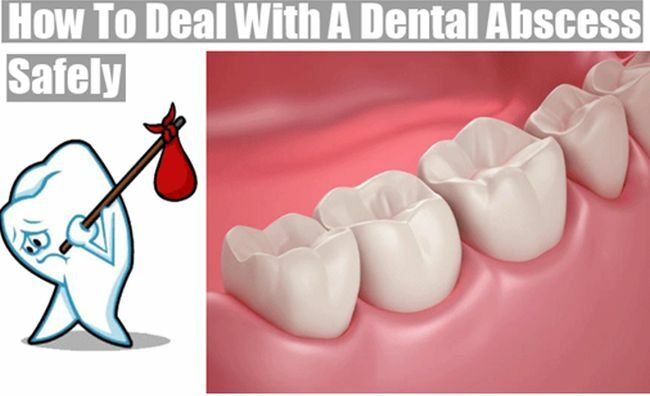 While these methods can help you deal with the pain temporarily, it is very important that you go to the dentist as soon as possible to prevent more complications and unnecessary discomfort.